who have spent years collecting and organizing information from the past. The Happy Valley archive team is always on the lookout for more material. 1933-34 Were there photos taken that year? She would be more than happy to scan and return the items. 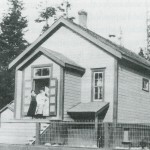 The opening of Happy Valley School in 1912 was a major event in the community. 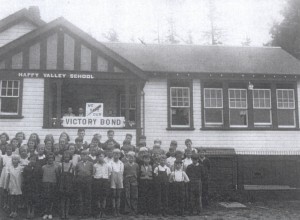 The Happy Valley School of today bears no resemblance to the old one room building. The school was built close to the road; inside was one room plus a cloakroom area and an entry hall. The first decade saw very little change in the school building other than adjustments to the heating system. From 1912 through 1928, one teacher taught all the grades. However, a large increase in enrolment in 1928 brought a secondteacher and then a second room was added. In 1945, an army hut was attached to the rooms and indoor toilets were added. The school population rose from 80 pupils in1950 to 195 pupils in 1959. During that time, additional rooms were added. By the mid-1960’s, there were six classrooms. Three were housed in a new building and three were housed in the old building. The grounds were undeveloped and a rocky slope separated the two buildings. During the late 1960’s the student population did not increase but there was significant activity in building and grounds development. The new building consisted of the three classrooms, a gym, a kitchen, a nurse’s room and the office and administrative area. 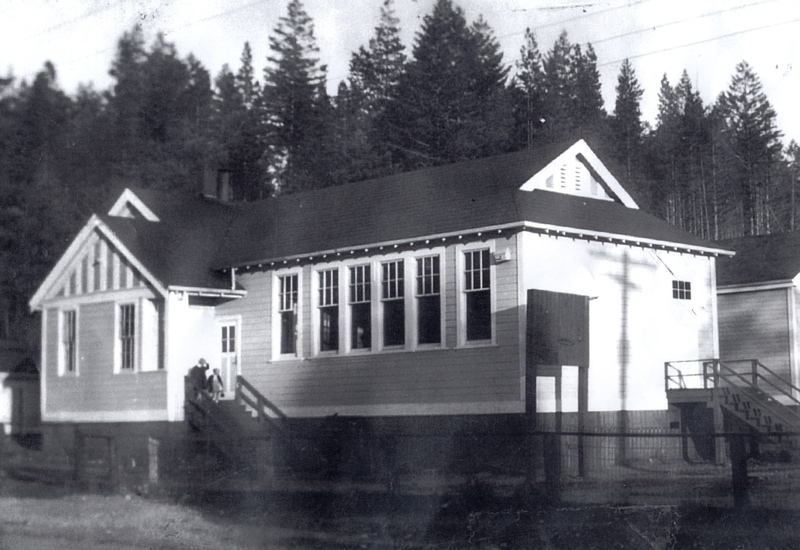 During these years, the three rooms of the old building were gutted and made into portable classrooms; three new classrooms plus a library were added to the new building. The front property was leveled and landscaped providing a decent playground. 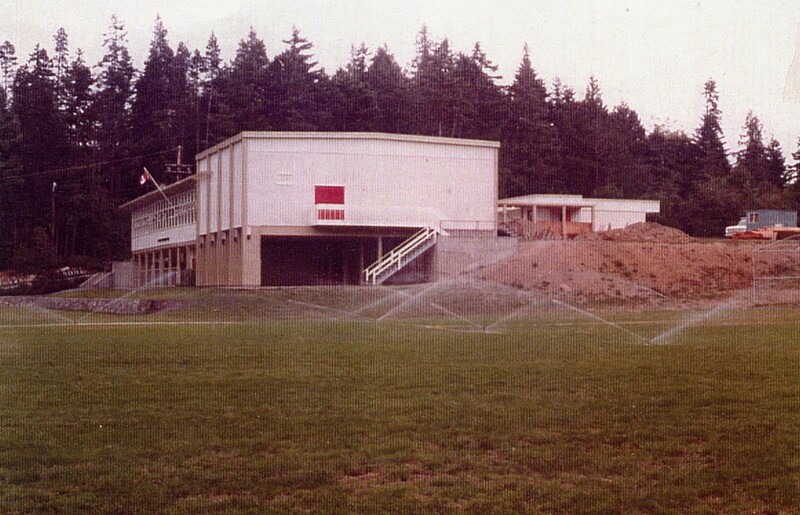 During the 1970’s it seemed that the school was always under some kind of construction. Many new subdivisions were opened up in the area and the student population shot up from 206 in 1970 to a peak of 406. The intermediate wing opened in 1970. In the mid-seventies, the primary wing was added, along with an extension to the gym, the new Library, and changes in the Office. By 1978, the population had dropped back to about 350, where it hovered through the 1980’s. The school wasoverflowing, with 2 classes housed in portables behind the school. During the 1990’s, the enrollment continued to decline. In 1999-2000, the School District reconfigured the schools to include Middle Schools. At that time, the Grade 7’s were no longer housed at elementary schools and the enrollment declined to below 170 students. With the computer age upon us, a computer lab was created in the mid 1990’s. The lower playing fields were completely dug up and a new drainage field was installed to curb the continuous wet, soggy grounds. With the beginning of the new millennium, many changes came about. In October 2004, a devastating fire completely destroyed the building and all records. 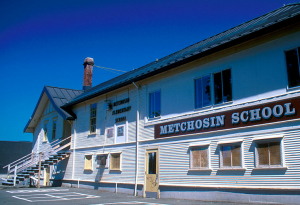 After a busy week of cleaning, organizing and setting up the recently closed Metchosin School site, the school enrollment of 170 students, along with staff became a united community in a temporary location. Metchosin School was over 10 kms away and presented many challenges for the staff and families. Children of all ages, some who had never been on a school bus, were being bussed to and from school every day. The outpouring of community, local and international support both financial and otherwise was a sight to behold. Donations poured in from as far away as Ontario and Oregon. We received donations of everything from books and pencils to coats and shoes, food, furniture, cultural performances, special visits by well-known people and groups from around the province. The school community rallied together as we created a happy, welcoming andsafe learning place for our students. It has been a long and busy 2 ½ years as we continue to replace and renew our belongings. The construction of the new building commenced in January 2006. 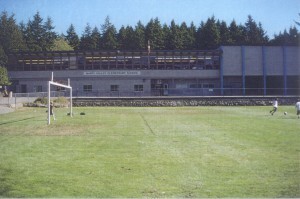 The building was constructed on the lower field close to the roadway with the playing fields being constructed on the back of the property where the former school building was located. 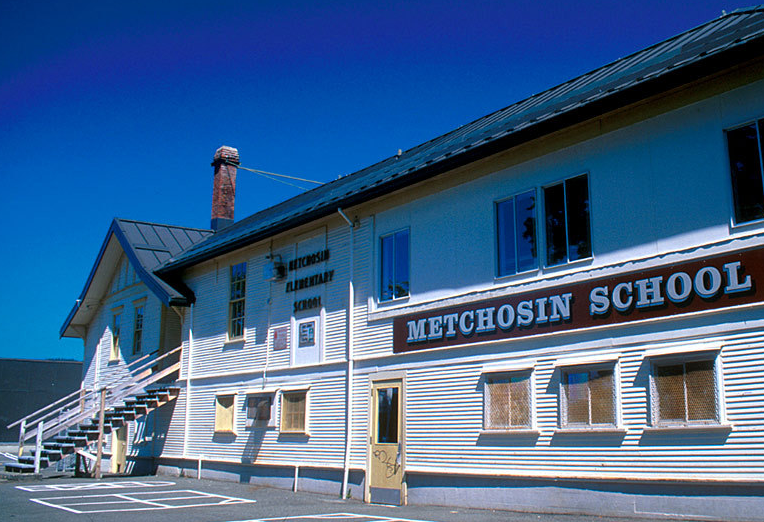 The staff and students moved from Metchosin School to the new building on January 22, 2007. We have returned to our former location with an enrollment of 180 students. We anticipate our enrollment to surge ahead very quickly as the building boom of family housing in the catchment area is unprecedented with hundreds of new homes being constructed. April 23, 2007 we officially open our new 2 story building with 8 classrooms, a computer lab, multipurpose room, library and a beautiful gymnasium. The District of Langford has added 3 additional community rooms attached to the gymnasium to be used in a local emergency. The new building has been constructed to current earthquake and fire standards and will provide a bright, clean and happy environment for the students and community for many years to come.